President Adama Barrow of The Gambia has on Monday 21 January, 2016 inaugurated a sixty five million dollars ($65m) African Development Bank (ADB) funded the Yeli Tenda and Bamba Tenda bridge; now called Senegambia bridge. The Bridge is said to connect the two banks of the country and equally served as the shortest connection for South and north Senegal. The approximately D4billion bridge was first conceived by former governments of The Gambia since 1979. The prospects of constructing this bridge have a long history as successive governments of The Gambia have struggled with it but for some reason never completed it. With the coming into office of the Barrow-led administration, it has finally been given enough attention to come to fruition. This bridge is said to be the longest in the sub-region as it spans 1.9 kilometers in length and stands high enough to enable the passage of most vessels. Longer mast boats will have to fold their masts to pass through. This is in line with the concept of integration of people and goods in the West African Economic bloc (ECOWAS). It is a step closer in this integration drive and will be of great benefit to the people of the sub-region. President Barrow said the inauguration of the Senegambia Bridge will mark the end of the suffering of the people of the two countries and beyond. He added that the long waiting hours endue by vehicle owners and commuters sometimes leads to the perish of farmers vegetables and even deaths for livestock’s and small ruminants. “For many years lots of agricultural goods from both Senegal and Gambia perished in stranded trucks that waits for their turn to cross the river. President Barrow said the bridge will facilitate trade, promotes integration and free movement of peoples, goods and services, adding that the project will not only benefit The Gambia and Senegal but as well the Sub region and the African continent at large. 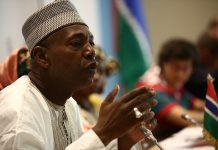 “The African Development Bank (ADB) has fittingly demonstrated their commitment to supporting the development, unity and integration of the African countries and accordingly, we are grateful and proud of the bank,” Barrow hails ADB for bankrolling such a worthy project that is expected to touch the lives of the people of the rural Gambia. Barrow commended the government of Senegal and its institutions for the support rendered towards the completion of this national edifice, he said, the completion of the Senegambia Bridge will solidify Gambia-Senegal relationship to another level. 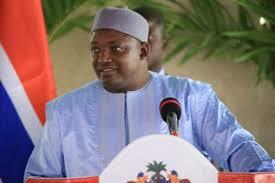 “The Senegalese institutions provided us with all the supports, this is not surprising looking at unique and cordial relationship that exist between the two governments and our people,” President Barrow applauds Senegalese institutions for the efforts in the realization of the much awaited Senegambia Bridge. For his part President Macky Sall of Senegal said the Senegambia Bridge belongs to the People of the Gambia who are its rightful owners, adding that the bridge will promote African integration and facilitate both inter and intra trade between African countries. Sall urges the people of The Gambia to give all the support needed to President Barrow and his administration in a bid to fulfilling his developmental aspirations for the people of the Gambia. ARESKI a Senegalese company that succeeded the previous contractors of the bridge says it will serve for one hundred (100) years. He said there will be tolled machines that will enable both passengers and vehicles to make payments intended to be managed by the National Road Authority (NRA) for the maintenance of the bridge. To the displease of many truck drivers and Gambians, ARESKI says traffic on the Senegambia Bridge will be limited to light vehicles and commuters, while disclosing that the project will formerly be completed in July to accommodate all types of vehicles.